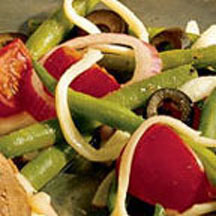 CooksRecipes has quality, kitchen-tested recipes for delicious salads featuring green beans as a main ingredient. 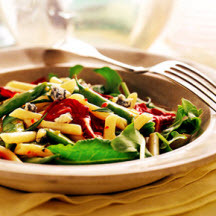 An Italian-style fresh green bean salad with shredded mozzarella cheese, cherry tomatoes, red onion rings, black olives and fresh basil tossed in your favorite Italian dressing. 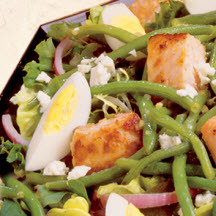 A heart-healthy, satisfying green bean and salmon salad garnished with wedges of hard-boiled eggs and crumbled feta cheese. This salad is at its best with crisp, fresh beans and radicchio. Add grilled lamb or chicken for a more satisfying entrée salad.